Forced marriage, forced labour and people trafficking all count as types of slavery. We might like to think that slavery is a thing of the past, but in fact in the 21st century the opposite is true. There are over 40 million people across the world caught up in the modern-day slave trade, according to a new report. And it occurs right under our noses, in every corner of the globe. In the UK, for example, Vietnamese gangs used nail bars as a front to traffic women and girls into the country for forced labour and sexual exploitation. And fish that ended up in the supply chains of many major US companies was caught by fishermen trafficked to Indonesia and forced to work in appalling conditions. Modern slavery affects vulnerable people fleeing war zones, some of whom are tricked into marriage with promises of a better life, only to have all their rights and freedom taken away. Modern slavery contravenes human rights and labour rights. Forced marriage, forced labour and people trafficking all count as types of slavery. 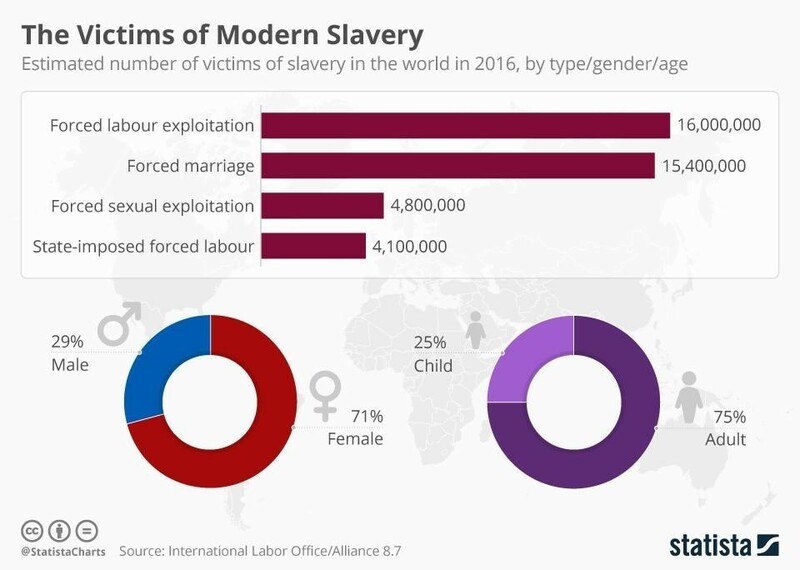 While modern slavery can take many forms, what victims all have in common is that they are threatened or abused or tricked into marriage or work. The report, which is based on research by the International Labour Organization (ILO), the Walk Free Foundation and the International Organization for Migration (IOM), estimates that at any given time in 2016, there were 15.4 million people living in a forced marriage. Over one third of those (37%) were children when they got married, many of them under the age of 15. Almost all of those forced to marry were women and girls (84%). The report also estimates that at any given time in 2016, there were 16 million people in forced labour, the majority of whom were women (59%). They were most likely to be involved in domestic work, construction or manufacturing. Forced labour can occur in many forms. Over half of people forced to work are doing so because they are in debt to those they are working for. But often, victims suffer more than one type of coercion. Nearly one-quarter of victims (24%) were told that their wages would be withheld if they left. One third (29%) were threatened with violence, either to them or their families, and 16% were subjected to physical violence, which included acts of sexual violence. Around a quarter of people in forced labour (4.1 million) are being forced to work by the state, often under the guise of economic development. Some work for weeks, others for years. On average, those in forced labour are held for 20.5 months before escaping or being freed. At any given time in 2016, 4.8 million people were victims of forced sexual exploitation. On average, they were held for 23.4 months before escaping or being freed. Almost three-quarters of those affected by modern slavery are women (71%). And 99% of the victims of sexual exploitation are women. Men only outnumber women when it comes to state-sponsored forced labour. Distressingly, one in four of those trapped in slavery are children. The report says that modern slavery is more likely to occur in some regions. In Africa, there are 7.6 victims of modern slavery for every 1,000 people in the region. Asia and the Pacific is next (6.1 per 1,000), then Europe and Central Asia (3.9 per 1,000). Whilst the report admits that there are some regions, particularly Arab states and the Americas, where data is not readily available, it also says that its estimates are conservative, meaning there could be many more people involved than the numbers indicate. 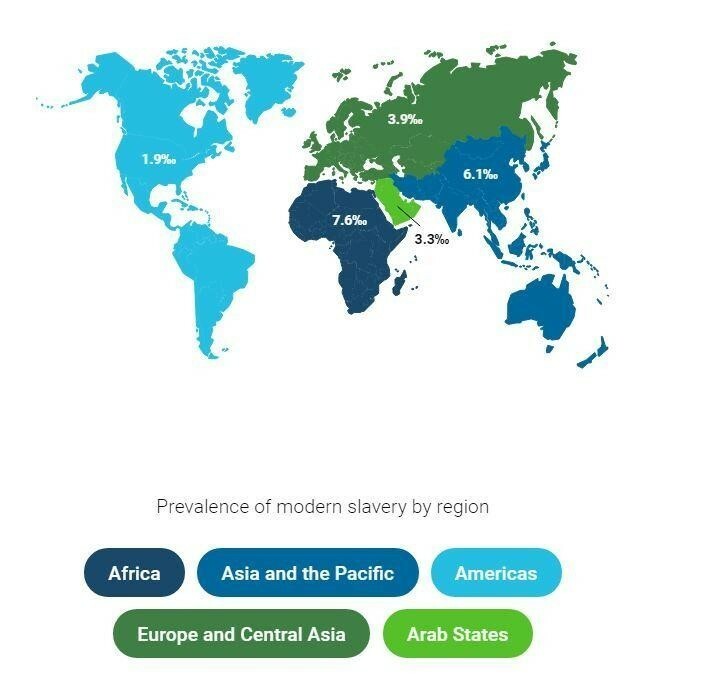 According to the Global Slavery Index 2016, 58% of those involved in modern slavery were in five countries: India, China, Pakistan, Bangladesh and Uzbekistan. The report concludes that while every country has its own challenges when it comes to slavery, there are some common answers. For instance, extending labour rights in the informal economy – jobs where people work for wages without any legal protections – could help to prevent exploitation. In addition, a large share of modern slavery can be traced to migration. Improved migration governance could help people who have been trafficked to another country. In states that are fragile and in conflict or crisis, guarding against modern slavery should become part of the overall humanitarian effort, says the report.